Ewan Mc Gregor, Jennifer Connolly, Dakota Fanning, Peter Reigert, Rupert Evans, Uzo Aduba, Molly Parker, Valorie Curry, Samantha Mathis, David Strathairn. Directed by Ewan Mc Gregor. 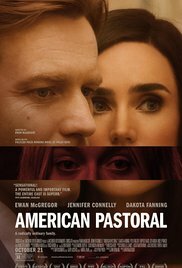 American Pastoral is based on a novel by Philip Roth. Over the decades, a number of Philip Roth’s novels have been filmed from Portnoy’s Complaint to The Human Stain and Indignation. This film is a work of devotion by Ewan Mc Gregor who has directed the film as well as taken on the central role. American Pastoral is an ironic title. The narrative opens during World War II, the central character, Swede Lvov (Ewan Mc Gregor) is an all-American sportsman, and idol of his time. He enlists, but returns as the war ends, moving in to manage the glove factory in New Jersey founded by his dominating Jewish father, Peter Riegert. However, he wants to marry the local beauty queen, a Catholic, Dawn (Jennifer Connolly) who is willing to be interviewed by his father and stares him down despite his objections, winning him over. The American Pastoral years are those immediately after the end of the war, Swede and Dawn marrying and having a little daughter, Meredith. Idolised by her parents, she nevertheless has a stammer and they take her to a therapist, Molly Parker, who indicates that this might be a control mechanism. As the story moves to the end of the 50s and into the 1960s, Meredith sees images of a Buddhist monk on television, self-immolating, and is emotionally upset, thinking that people do not care. The pastoral ends with the Vietnam war and Meredith, age 16 (Dakota Fanning) an embittered young woman, resenting her successful parents, meeting up with like-minded young people against the government, eventually throwing a bomb into a baker’s shop in New Jersey and having to go on the run. For the rest of the film, Swede is obsessed with finding his daughter, cruelly tantalised by one of her friends who pretends to be researching the glove industry but is really trying to get money out of Swede. Dawn, on the other hand, is hurt by her daughter’s antagonism and opts to ignore her, deteriorating mentally with a strong scene and a diatribe against her husband and all that he stood for and how she should not have married him. The framework of the film is a 1990s school reunion where a writer, David Strathairrn, encounters Swede’s brother and finds that Swede is dead and about to be buried. The funeral scene has quite some pathos, the writer observing, Dawn present with ambiguous grief – and Meredith finally turning up to stand by her father’s coffin. The acting is very good, Mc Gregor always reliable, Jennifer Connolly with some strong scenes and a surprising Dakota Fanning in the role of Meredith. An opportunity to reassess the transition in the United States from the 1950s into the 1960s and the violent years beyond. 1. The title, expectations? The overtones of ideas and calmness? 2. Philip Roth, New Jersey background, Jewish background, Catholics? The 1940s to 2000 and the trajectory of the average American and the average American family? 3. Audience knowledge of this era, the all-American sports hero, the beauty queen? The war, the literal pastoral aspects of New Jersey? Jewish Catholic intermarriage? Vietnam, the war, the role of the leaders, protesting, revolution? The movements and individuals? The repercussions? 4. Introduction with the reunion, Nathan Zuckerman and his voice-over, arriving at the reunion, his wondering why he went? Meeting Jerry? Not knowing what happened to Swede? Getting information, hearing the story from Jerry, narrating it? 5. The Lvov family, Jewish background, New Jersey, settled in America? The glove factory? Dawn, love for Swede? Going to the interrogation, her phone stances, Catholic requirements, the father’s reaction? Swede standing by her? Swede and his reputation? Marriage, working in the factory? The birth of Meredith, the happy years? 6. Meredith and her stutter, going to Sheila for therapy, the different opinions, Sheila and her observations about why Meredith stuttered, controlling mechanism? Her later helping Meredith, with the underground? Swede confronting her? Her attitudes towards Dawn and Dawn getting a facelift, for therapy? 7. Meredith, at home, the teachers’ reaction, her book of stuttering? Moon River and Audrey? Camping with her father, her direct kiss and her father’s reaction? The television, seeing the monk burning, the symbol of her transition to revolution and accusations that nobody cared? 8. Meredith at 1’s 6, her reactions, the causes, her bitterness? Despising her mother’s role as a beauty queen? The treatment of her mother? Her father as a sporting hero and mocking this? Her character, the transition from 13 to 16, hard and bitter, her friends in New York, away from home, her father trying to impose some discipline? 9. The footage of the groups, the University revolutions, the streets, New Jersey, the demonstrations outside the factory, shootings, Vicki and her reaction, staying with Seymour, supporting him? 10. The bomb, Dawn and Swede visiting the mother and son, the pathos, the mother observing that they did not have peace with their family as she did despite her husband’s death? 11. The role of the FBI, searching the house, Meredith’s room? 12. Swede’s inability to believe the truth about his daughter, the years passing and his brooding on this, moving from the 60s into the 70s? His continued search? The arrival of Rita, writing the thesis, charming, the interview, making the special gloves for her, her turning on him, demanding the money? The rendezvous in the hotel, her sexual approach, Swede and his leaving, in the street, confronting her vehicle? His later seeing her, her reactions about the revolution, letting him know where Meredith was? 13. Dawn, giving up, her tirade against her husband and all that he stood for, that she should have married someone else? The artist, the exhibition, the barbecue and her behaviour with the artist, Swede’s reaction? 14. Finding Meredith, talking with her, trying to understand her, her philosophy, the sect and the mentality, her admitting the murders? Swede thinking she was wanting to do penance? His bringing the books to her? 15. Dawn, in the mental institution, wanting the facelift, Sheila supporting this? The change? 16. The background of Swede’s father, industrialist, pride, Jewish background, wanting to be at the office, Vicki’s support? His acceptance of Dawn, the domestic sequences, delight in his granddaughter? Blunt and direct in his observations, at the art gallery? Jerry, his relationship with Swede? 18. The sad irony of the title?